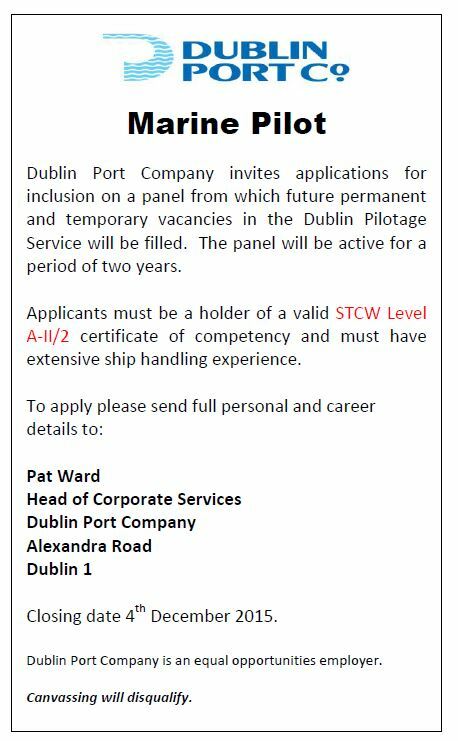 Dublin Port Company invites applications for inclusion on a panel from which future permanent and temporary vacancies in the Dublin Pilotage Service will be filled. The panel will be active for a period of two years. Applicants must be a holder of a valid STCW Level A-II/2 certificate of competency and must have extensive ship handling experience. Closing date 4th December 2015. Dublin Port Company is an equal opportunities employer.Canvassing will disqualify.